HMAS Darwin, HMAS Melbourne, HMAS Parramatta and HMAS Toowoomba steam line astern during their departure from Sydney Harbour during the fleet departure for Indo-Pacific Endeavour 2017 (IPE 17). Image via Commonwealth of Australia. An Australian Defence Force Joint Task Group departed Sydney on Monday to take part in a series of key military exercises throughout the Indo-Pacific region. Running from September to 26 November, Indo-Pacific Endeavour will focus on enhancing military co-operation with some of Australia’s key regional partners, including Brunei, Cambodia, the Federated States of Micronesia, India, Indonesia, Japan, Malaysia, the Philippines, the Republic of Korea, Singapore, Thailand and Timor-Leste. The deployment, being led by Canberra-class amphibious assault ship HMAS Adelaide, is made up of more than 1,200 ADF personnel. 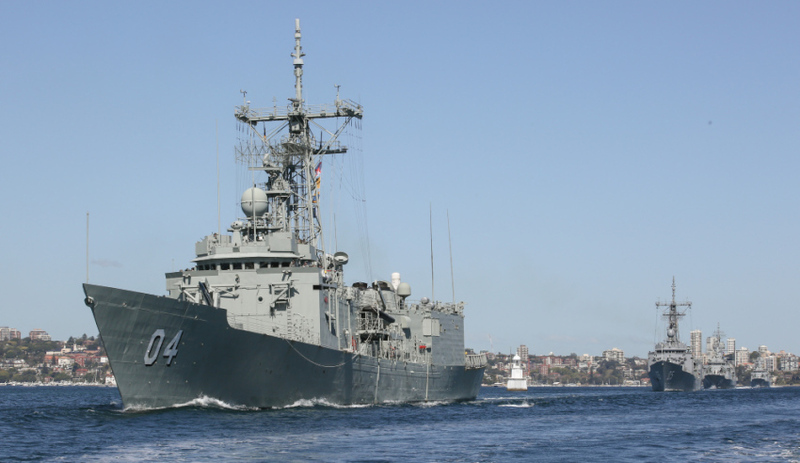 HMAS Adelaide will be accompanied at various stages of the deployment by HMAS Melbourne, HMAS Darwin, HMAS Toowoomba, HMAS Parramatta and HMAS Sirius, making this the biggest co-ordinated task group deployment since the early 1980s. The Indo-Pacific Endeavour deployment, which has been in planning for more than 12 months, is part of ongoing efforts to enhance and develop strong positive relations with regional militaries through both dialogue and practical activities, according to Minister for Defence Marise Payne. "This deployment is another opportunity to promote security co-operation in the region and exercise our humanitarian and disaster relief capability where it may be used," said Minister Payne. "The ADF regularly conducts exercises with a range of militaries to strengthen relationships and co-operation." The minister said activities like Indo-Pacific Endeavour generated personal relationships, shared experiences and common understanding with our regional partners that could be crucial to success in times of uncertainty or crisis. "Maintaining the rule of law and respecting the sovereignty of nations large and small is fundamental to continued peace and stability in our region," Minister Payne said. Indo-Pacific Endeavour will also involve service personnel from the Australian Army and Royal Australian Air Force and include Defence civilians, ADF helicopters and fixed wing aircraft. "The Joint Task Group will demonstrate the ADF's ability to operate across the full spectrum of military operations, from high-end military capabilities such as anti-submarine warfare to humanitarian assistance and disaster relief," Minister Payne said.